Home to the 2010 US Amateur and the 2015 US Open, Chambers Bay is the 22nd rated course and one of the greatest golfing destinations in the Pacific Northwest. Born of a former sand and gravel mine, my favorite golf course architect, Robert Trent Jones, Jr., was tasked to "create a world-class golf course, enjoyable for golfers of any skill level, capable of hosting major championships and events." Quoting Chambers Bay's website, this line perfectly sums up my feelings about this breathtaking city-run property: "The extraordinary views of Puget Sound, the Olympic Mountains and the unrivaled scenery create an environment where golfers enjoy not only world-class golf, but also a sense of visual nirvana." The visual nirvana begins early on the facade of the Chambers Bay clubhouse, where the 920-acre property can be seen in its entirety. Each hole provides the opportunity for a perfect golf photograph. Views of the Puget Sound and dramatic hillsides abound on all eighteen holes, and the links-style mounding creates stunning contrast to the otherwise rolling fairways and greens. Chambers Bay is somewhat reminiscent of another future US Open course here in my home state of Wisconsin: Erin Hills. 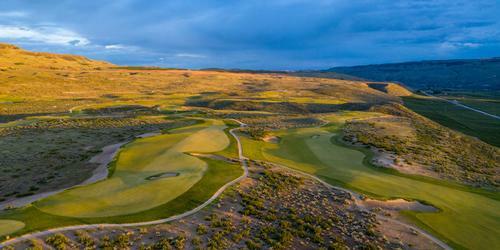 Each is a links-style course with an entirely fescue golf experience. The swift fescue fairways transform harmoniously in to challenging green complexes where there is little discernable difference between the fairways and greens. Because of this, the greens are able to be placed virtually anywhere, and short wedge play is discouraged as anything within 30 yards can be putted as effectively. This threw me for a loop during my round. A walking-only course, the greens are generally raised and heavily mounded, with many of them given an "infinity" like effect (think of an infinity pool, and the way the edge of the pool seems to blend in with the ocean beyond it - many of the greens here feature the same effect with the Puget Sound beyond). The greenside mounding is considerable, and over-hitting approaches is penalized by massive hills that have to be putted up in order to re-find the green surface. My 95 during Sunday's round included seven miss-hit putts that did not traverse quite far enough to stay on the green before rolling back to the same general area where they started. My 95 also included four sand-to-sand shots, epitomized by two on the devilish sixth green complex. The bunkers at Chambers Bay are eerily similar to those featured on Pete Dye's courses, especially at Whistling Straits. They are the most natural areas of the land at this great site, and like the ones found at the Straits or at Erin Hills, jut in all directions, can be quite deep, and when around the greens are generally fairly narrow, creating terrible downhill lies and stunted sand shots that make for a huge challenge to hold. The sand is far from the only indigenous feature at Chambers Bay. Much was left of this land's rich heritage, including beautiful ruin-like structures on the seventeenth and eighteenth holes that add character and promote faux-professional amateur photography. The elevation at Chambers Bay is extraordinary, and nowhere is this more evident than on the par three ninth. A drop of 100 feet is featured from the teal, navy, sand and white tee boxes, which are perched above a vast sand trap that lies another 30 feet below its undulating putting surface. Missing short here is an almost guaranteed bogey, which I discovered the hard way. Finding the bottom of the sand off the tee, my third shot from the top of the bunker rolled right and downhill almost endlessly until it stopped one foot from the pin for a gimmie bogey putt. While most fairways are wide and inviting, there are several that are almost impossible to hit. The 425-yard par four tenth narrows between dunes and leads to one of the course's hardest hit greens, while the drivable 262-yard par four twelfth features a fairway no wider than about 20 yards as it funnels uphill. While these are drastically different holes, the tee shots on each are intimidating, to say the least. The 920 acres of Chambers Bay's layout features but one tree, which is seen from many holes on the course but is featured magnificently on the par three fifteenth, aptly named "Lone Fir." This downhill tee shot is to a large green that slants heavily from left to right, making the best approach either long to the backstop, or left just short of the deep pot bunker. My tee shot was headed straight towards this bunker, and fell right to twelve feet above the pin. The sand features found wayward of the fairways at Chambers Bay sprawl significantly, making accurate tee shots necessary. Holes two, four, five, seven, eleven, thirteen, fourteen, sixteen and eighteen all have monstrous sand areas that plunge deep from the playing surface. The fairway mounding often influences these drop-offs, and sometimes even takes away the forward momentum of well-hit shots to the point that they fall down steep hills in to sandy lies that have to be hit with lofted clubs to get out of. One aspect of Chambers Bay that I was surprised with was the speed of the greens. They had recently been aerated, but no plugs were pulled and only a mild top-dressing was added. The speed, I was told, is comparable to the "normal" stimping, which is relatively slow. These slow green speeds influence aggressive play, especially from off the putting surfaces, but I assume they will be sped up notably for championship play. If Erin Hills' fescue greens rolled at an eleven during mid-June, Chambers Bay's were closer to a nine. The dramatic undulation found in all of them keeps putting at Chambers Bay far from being trouble-free, and I actually think they would be made easier if they were sped up. After checking in at the pro shop, I was met by the course's shuttle to bring a handful of us to the practice range at the base of the hill. The fescue hitting surface on the range is similar to that on the course, and I was glad I failed with some wedges early and learned my lesson about hitting them on such finely shaved surfaces. After hitting a half bucket of practice balls on the range (included with greens fees), the shuttle picked us up and brought us to the first hole tee area, which also features a large and swelling practice green. It was evident quickly that these putting surfaces would not be anywhere near as quick as I'd expected - very good to know ahead of time! I met David, Roland and Maricel, who I would be playing with for my round, here and we each chose our tee boxes. Of the five sets available, we had one player at four different boxes. Dave, a four-handicap from Atlanta, started on the teals until we were warned it was not allowed. In fact, we were told that anyone caught on these tees two times would be asked to leave. He then switched to the navy tees, which measure to 7088 yards (compared to 7564 from the teals). The starter advised us to add at least 200 yards to the overall distances to account for the nuances found on an all-fescue golf track. I chose the sands, which are a more pedestrian 6420, and are strongly suggested for players whose handicaps are between seven and fifteen. As an 11.5, these provided plenty of challenge. Roland and Maricel, a nice young couple from Vancouver, played from the white (5890 yards) and blue tees (5132), respectively. I was happy with my selection of the sand tees on the first hole when Dave had a 491-yard par four start compared to my 465. I hit a long drive left, finding my first deep fairway bunker of the day. Headed out toward the Puget Sound, the first hole is a big test to open a round. The fourth is a short par five by most course's standards, but at Chambers Bay plays anything but. With a tee shot straight down the fairway, the green is reachable with a massive second shot, but flirts the entire distance with a massive sand and waste area that falls far from the hitting surface. Six, while not overly intimidating from the tees, has one of the toughest green complexes on the entire course. With three craggy bunkers surrounding its narrow green, the mounding around the fairway leaves most wayward tee shots with blind approaches. I was blinded entirely, and found myself in the narrowest of these greenside bunkers (to the left), which did not end well for me. A normally long par four nicknamed "Humpback," the seventh is currently playing to a more manageable distance around 300 yards. The actual green has been out of commission since February, and is being reworked to soon feature an uphill approach area that keeps short shots from falling more than 50 yards from the green, and well hit shots from consistently bouncing long. This will be a glorious par four, with two large fairway mounds that resemble the hump-like backs of the celebrated whale for which the hole is named. As it is currently just over 300 yards, this is far from an easy hole, with a rolling green (normally a fairway, of course) found in a dramatic swale adjacent to the sand collection area. The eighth provided all kinds of issues for my game on Sunday. The hillside left is tall and slopes towards the fairway. Not even this huge slope could usher my first two shots toward the fairway, though, and I found myself hitting from high off the hillsides. My third shot was well-struck from a hiking path forty-plus feet above the playing surface, landing on the green and subsequently rolling down and off the right side. It would take me four attempts to putt the ball hard enough up this greenside mounding to finally re-find the putting surface. The number one handicapped hole on the course, the entire right side drops steeply from the fairway and can add considerable distance to this already long par five. The ninth is one of the most highly elevated par threes I have ever seen. The teal, navy, sand and white tees are one hundred feet above the green, with almost vertical sand traps lying thirty feet beneath and right of the green complex. At 168 yards from the sand tees, a prevailing head wind held my six-iron up high enough to bury short at the base of the front-side trap, leaving a wall of sand to be carried to find the green surface. The tenth hole runs parallel to the first, but requires two much more demanding shots. The dunes and fairway bunkers on each side of the fairway make accuracy off the tee important, and the approach is even more challenging to a narrow green with deep pot bunkers all around. The twelfth hole at Chambers Bay is best described by its name: "The Narrows." This uphill drive is short at 262 yards from the sand tees, but is anything but easy! High dunes encompass each side of the driving area, and anything sliced will end up in tall fescue with no visible approach. I found myself on one of these dunes, which created one of the most fun shots of my entire round. A course employee and I found my Callaway Hex Black embanked in a hillside just off a walking path, about 75 yards from the front of the green. This green is long - about 50 yards from the front to the back, and the left side of the complex is heavily raised and can be used to bank shots off of to find the putting surface. The staff member gave me a line which was easily 15 yards further left than I'd expected, and I somehow managed to hit a pure shot off the bank and roll to about 30 feet above the pin. We shared a bit of a "bromance" on this hole, ending in high fives and an enthusiastic fist bump. The thirteenth is a wonderful par five. At 512 yards from the sand tees, the drive is to a wide area that is primarily blind. From there, the hole gets very interesting. Huge lowered sand traps that are dropped from the right side of the fairway area influence a layup to about 100 yards out, and the left side of the green area rolls right to a small green that falls off to that side. The tee shot on the long par four fourteenth is awesome. The back tees are played from highly elevated boxes, and must carry about 200 yards of depressed wasteland to find a fairway that slopes strongly from right-to-left, and considerably downhill. I had one of my longest drives of the day on this hole, leaving about 120 yards in to a large green that slopes right to left on the back. The fifteenth, nicknamed "Lone Fir," features the only tree on the entire golf course prominently against the back drop of the mystical Puget Sound. A short par three, this is my favorite hole at Chambers Bay. Use the left side of the green area to roll the tee shot from left to right toward the center of the green, or aim to the back of the putting surface to carom the shot off the raised back-side. A long sand area runs the length of the right side of the sixteenth hole, parallel to the train tracks and shoreline of the Sound. The tabletop green is nestled between sand on the right and long sides, and a tall dune beyond. The seventeenth is a gorgeous par three that plays somewhat comparably to the fifteenth. A mid-range tee shot of 172 yards from the sand tees plays to a green that is risen above sand traps short and to the right, while the back falls ominously to a lowered collection area that requires a challenging, short uphill approach to re-find the putting surface. The finishing hole at Chambers Bay is a mid-length par five from the sand tees of 514 yards. The fairway is mercifully wide, but narrows toward the green area and is defended on the right side by a long sand trap and on the green surface itself by significant undulations. I had three great shots to get close on this hole, only to find myself ten feet above the pin with a horrendous downhill putt that took me three strokes to finally hole. David had the right idea, holing out from 40 yards off the green for birdie. Chambers Bay is a magnificent golf course, and a wonderful eight-mile walk that culminates in a view up to the clubhouse that is perched well above the eighteenth green. Thankfully, a short walk to the snack shop by the first and tenth holes leads to the shuttle bus and a merciful ride up to the clubhouse. The number 22 ranked golf course in the country (GolfWeek, 2012), Chambers Bay was a logistical magnum opus to bring to life during last week's work trip: Checking the clubs, renting a car, driving two and a half hours to and from Portland, and all in a short time frame that left ten minutes of range time. I cannot say enough, though, how well worth the efforts it was! 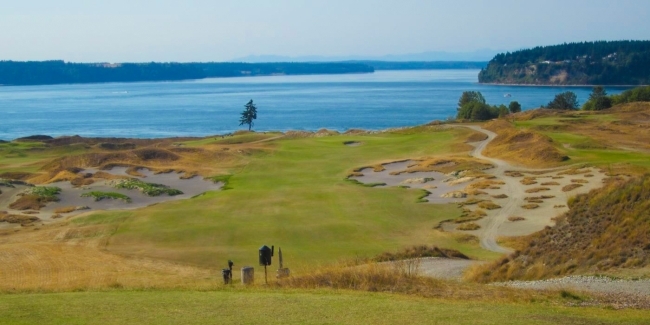 If you find yourself in the Pacific Northwest, do not miss out on the opportunity to play this Robert Trent Jones, Jr. masterpiece before the best in the world do in 2015. Paul Seifert is an often-proclaimed golf addict, and publisher of WiscoSportsAddict, a blog started in August, 2011, as a forum dedicated to reviewing courses and sharing the best of the best in the state with other avid Wisconsin golfers. Having started playing in Hartland-area leagues at the age of 12, Paul is a classic over-thinker who averages between 80 and 120 rounds per year, and despite carrying a 13-handicap, is committed to the ongoing improvement of his game. A health care equipment salesman by day, Paul does not claim to be an expert golfer, but is certainly an expert golf enthusiast who loves the sport and enjoys the writing, research, statistics and photography that make for interesting golf conversation.